It seems like yesterday when I first plugged in my computer and connected to AOL, I can still hear the unmistakable sound of connection as a new world opened up. As technology in our computers and cell phones change daily, so does the technology in ultrasound. Sure some of the systems are smaller and faster, but do they truly provide the same diagnostic accuracy as their big brothers? Although SonoSite has been the leader in portable ultrasound systems, GE’s Venue(TM) ultrasound system is like an a la carte diagnostic device: Choose your desired modality and you are off and running. The system is without a keyboard and instead contains a USB and SM card so that the clinician can plug in the probe, scan, review results. The portable ultrasound system was designed for vascular, anesthesia, interventional, musculoskeletal and point of care modalities. There is definitely a need for the light-weight and portable in a point of care environment, time will tell how these mighty systems compare to the dinosaurs before them. The Video Case Studies provide an in-depth look into specific cases that you may encounter in your practice. The Clinical Image Gallery is designed to give you a look at expert ultrasound images for anatomy recognition and as a quick comparative reference for you to compare your results to. 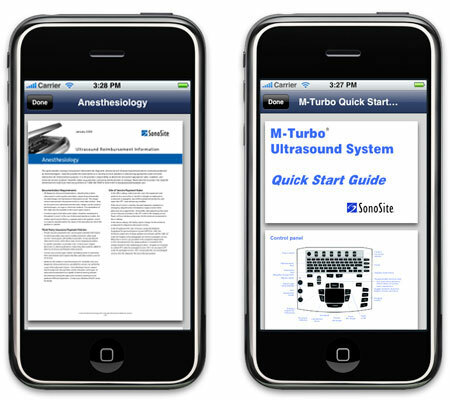 The Quick-Start Guides are abbreviated user manuals designed to give new SonoSite users a digital roadmap of their system’s controls and features to help navigate the user interface. The Reimbursement Guides are designed to provide general coverage and payment information for diagnostic ultrasound and ultrasound-guided procedures so you have accurate coding and billing information. The SonoAccess News Feed keeps you up-to-date on the latest SonoSite news. Would love to hear feedback on this – Comments are closed, you have to sign up, first. WAUWATOSA, WIS. – GE Healthcare, the $17 billion business unit of General Electric Company (NYSE: GE), today introduced the new Venue™ ultrasound product line to the medical market. The Venue 40, the first product launched, provides visualization for needle guidance procedures and rapid diagnostics in real-time at the bedside. These “point of care” settings are the fastest growing in ultrasound around the world. In the U.S., these applications grew an average of 30 percent per year over the past four years, as cited in a recent 2008 industry report issued by Klein Biomedical Consultants, an internationally recognized source of ultrasound market trends. An intuitive touch screen and streamlined design make Venue 40 easy to use and easy to clean, especially for clinicians who use ultrasound to make immediate care decisions, or guide procedures. Clinicians can execute all functions through an intuitive touch screen. Annotations and measurements can be entered quickly and precisely with a stylus. The sleek system is free from buttons, knobs or a keyboard on its touchscreen. Its small size and streamlined cart allows for imaging in some of the smallest of clinical spaces, such as at the bedside or in a trauma bay. The lightweight Venue 40 system can be easily transported from room to room. A clinician can quickly dock the compact ultrasound unit in the cart or table dock, without tools.